Not Maghrebi news per se, but this has been on mind lately, especially in light of the Swiss potential ban on mosque minarets. Reading this piece in the New York Review accentuated my utter puzzlement with this European malaise with Islam, taking on one of the most controversial Muslim European intellectuals, Tariq Ramadan. The author reviews two books, one of which is Tariq Ramadan's latest What I Believe. Ramadan felt compelled to write such a short book in order to explain his views on Islam, which he has articulated over the past 25 years. 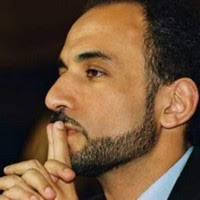 The reviewer advances Caroline Fourest's book Brother Tariq: The Doublespeak of Tariq Ramadan as a reference for criticizing Ramadan. However, that book should hardly serve as a reference. In a recent show on French TV France 3, Ramadan debated Fourest on her charges in the book, in which he found more than 200 citation errors and misquotes. It is also odd that the fervor against Ramadan and the charges of "doublespeak" seem to center around his lineage to maternal grandfather Hassan al-Banna, founder of the Muslim Brotherhood and Islamist father Said Ramadan. Do we need him to abjure his family ties to remove that specter of fundamentalism? Ramadan has always been clear in his argument for promoting Ijtihad (interpretive reasoning), and for a new reading of Quranic and Hadithic texts in areas of social and interpersonal affairs. His much publicized call for a moratorium, during a debate with Nicholas Sarkozy in 2003, on corporal punishment, stoning and death penalty was an indication of an Islamologist's serious attempt to force Muslims to adopt a pedagogical stance towards their scripture when it does not pertain to creed or the fundamental beliefs of the religion. The hostility towards Ramadan is particularly strange given how reformist he is - what he advocates is that muslims make their positive mark on Europe by being fully engaged in society and balancing the materialistic tendencies of the western civilisation. I took an interest into his books lately, the sharpness and greatness of his ideas just struck me with awe. "Western Muslims" just revolutionised the way I think about the role of Muslims in the west. He is, and will be, undoudtedly, one of the greatest Muslim reformists of this age in Europe. He is the example that should be given whenever someone asks "why the moderate muslims are silent" - they are not silent, they are silenced. Well said Algerian Review. IT is truly puzzling how smeared he is. Thanks TR for the link.